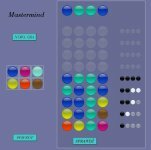 Mastermind is s game that once was very popular. The goal in this game is to guess 4 hidden marbles. The task will be accomplished and the game won if within 9 turns the player will guess those marbles. In each turn the player chooses 4 marbles, and then he/she checks whether it was the right guess. Each correctly guessed marble (the marble with the correct colour and in the right place) is signalled by a black dot. If the player guessed the colour of the marble but did not guess its location, it is signalled with a white dot. The player does not know which marbles are right and which ones are not. 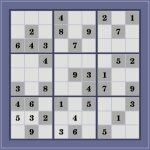 The game is available in 2 variants: the simpler one with 4 columns and the more difficult one with 5 columns.